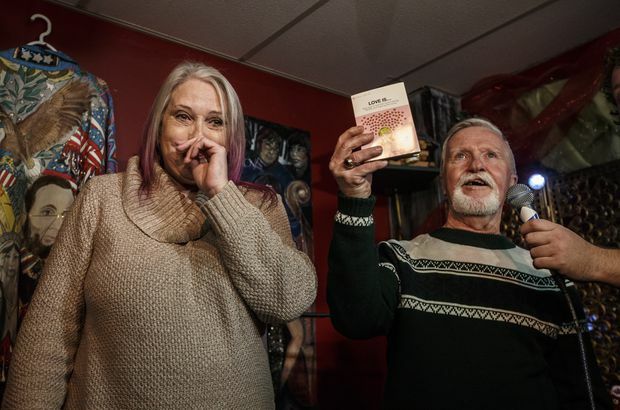 Adrian Pearce and his ex-girlfriend Vicki Allen open a 47 year old gift, a book called Love Is, which she gave him when they broke up in 1971, in St. Albert, Alta., on Dec. 6, 2018. But when she handed it to him, she broke up with him. Dejected, Mr. Pearce returned to his family’s home, threw it under the Christmas tree and vowed never to open it. The story last December about the unopened gift appeared on TV, newspapers and websites around the world. And as Ms. Allen stood on a stage in a packed cafe northwest of the city and peeled away the paper with Mr. Pearce standing beside her and his wife, Janet, in the audience, she herself didn’t know what she’d see because it was so long ago and she’d forgotten. It was a small book called Love Is: New Ways To Spot That Certain Feeling with cartoons and sayings about love. “The irony is extreme,” Ms. Allen cried. “Love is all of us, all of you, here tonight for the Christmas Bureau of Edmonton,” Mr. Pearce responded. Days after Mr. Pearce’s story appeared last Christmas, a friend who knew them both in high school sent Ms. Allen a link to one of the many articles written about it. Ms. Allen responded by clicking “like” on some of Mr. Pearce’s Facebook posts, and Mr. Pearce figured out who it was. They got in touch, and eventually Mr. Pearce and his wife were invited to meet her where she now lives in British Columbia. They learned that they all got along. They also learned the reason Ms. Allen dumped Mr. Pearce all those years ago. It turned out that while Ms. Allen was shopping for Mr. Pearce’s gift at the mall, she met another boy and he kissed her on the spot. “It wouldn’t have been so bad, but I kissed him back,” Ms. Allen said. She said she knew Mr. Pearce would find out she had betrayed him. She knew it was over between them. “It was a very innocent relationship. We were in high school,” Ms. Allen explained about her relationship with Mr. Pearce. 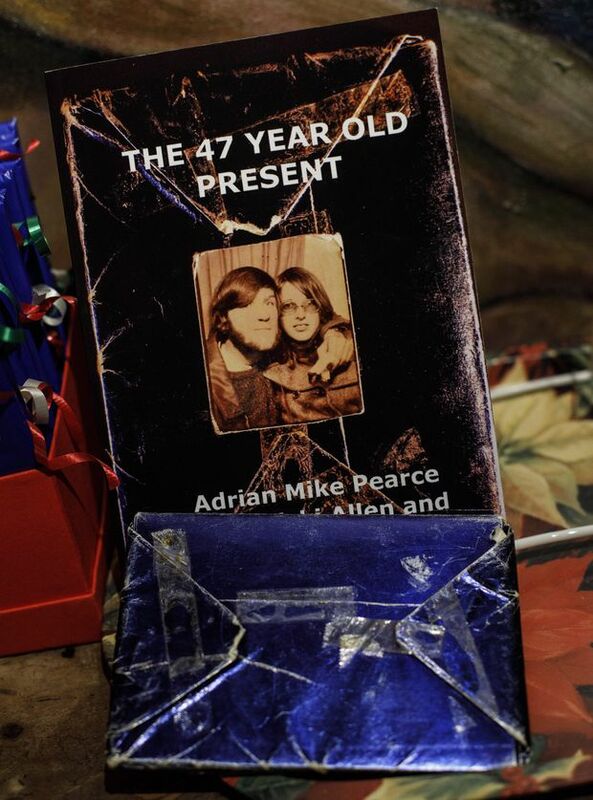 The book Adrian Pearce, Vicki Allen and Jan Piers wrote together, pictured along with the 47-year-old gift. For years, even after he’d married, Mr. Pearce still placed the dog-eared gift under the tree every Christmas. He enjoyed the mystery of it, but eventually his wife put her foot down when their daughter, then five, wanted to open it. “She said, ‘Daddy, when you die, I’ll be able to open it then, right?’ I told him he could keep it, but we just didn’t want [the gift] out in public,” she explained. Some people had accused Ms. Allen of being a terrible person for giving Mr. Pearce a Christmas present and then breaking up with him. Mr. Pearce has also been called everything from “Heartbroke Bloke” in the British press to “moron” in one New York newspaper. He’s since written a book about the whole experience, and his wife and Ms. Allen contributed chapters. “I think it’s absolutely fantastic that we’re friends. My wife is friends with [Vicki],” Mr. Pearce told the crowd.